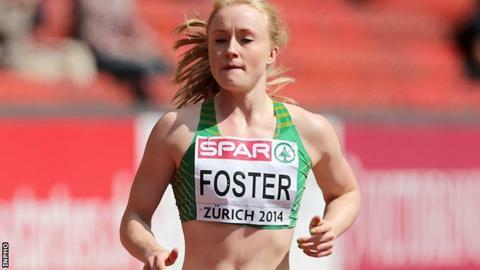 Amy Foster showed impressive form at Sunday's indoor meeting at Athlone in winning the women's 60m. The City of Lisburn sprinter clocked 7.33 seconds while county Londonderry man Adam McMullen won the long jump with a season's best of 7.72m. Foster's time was .01 outside her personal best set in 2014. Meanwhile, Holywood runner Paul Pollock set a new personal best in a 10km road race with 29:42 in Chichester as Kevin Seaward clocked 23:59. Belfast runner Seaward has the best Olympic marathon qualifying time for Irish athletes and has probably already done enough to secure his place in Rio. Seaward will pace Pollock at the London Marathon in April as the Holywood man bids to join his training partner on the plane to the Olympic Games. Pollock has also achieved the qualifying time but, as it stands, is unlikely to run in Brazil as Sergiu Ciobanu and Mick Clohisey are both faster on the clock than the county Down and only three Irish runners will be able to compete in the event in Rio.